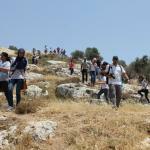 The trip was organized as part of a wider outreach project by youth activists, a project that aims to empower Palestinian youth to help their local communities with the social, agricultural and environmental problems that the construction of the wall and settlements, and continued Israeli occupation causes. The activities commenced at the Cremisan Monastery from where the group walked towards the village, through an area of outstanding natural beauty, full of a wide variety of fruit trees and much other greenery. The view of the horizon, however, was a grim reminder of the Israeli occupation, as the settlement of Gilo can be seen in the distance. The settlement, which houses more than 122,000 settlers, is built on land that has been stolen by Israel, through the construction of the apartheid wall and the other means of land confiscation. When a famous quote of Israel's first Prime Minister, David Ben Gurion, is recalled "the old will die, the young will forget", the importance of such projects as this is drawn into sharp relief. The effect of the arrival of such a large group of Palestinian youths entering the area immediately resulted in a heightened presence of the IOF, and as they walked to the Hanieh spring, they found soldiers blocking their path. Settlers could be seen in the distance relaxing at the spring which has been an essential natural resource for Palestinians living in the area for generations. The IOF tried to pressure the group to leave and return home, which prompted the youths to sit down and sing songs about the Arab character of Palestine and the inevitable demise of the occupation. Al Walaja is located south west of Jerusalem. The village was occupied in October 1948, but Palestinian and Egyptian guerillas fought off the Israeli battalions and successfully defended the village. Several times they were able to force the Occupation troops to withdraw, but in the end the village was occupied and the houses demolished to prevent return of the villagers. (Al Khalidi, Wallid 1992: All That Remains). The people of al Walaja, who numbered some 1200 people at that time, were expelled and turned into refugees. Some of them remained in lands of Al Walaja that were not occupied, while the rest left to Jordan, or moved into the refugee camps in Bethlehem. After 1967 the Occupation annexed the rest of al Walaja to the municipality of Jerusalem, but without giving the people from Walaja the right to live in Jerusalem, meaning they were threatened with expulsion once again. Since the late 80s the occupation forces have been using various policies against the people to force them to leave what is left of the village, including house demolitions and repeated arrests of members of the village, now numbering 3000 inhabitants, using the pretext that "they have West Bank identification cards and are living in Jerusalem". The Apartheid Wall, as projected, will surround Al Walaja from all sides isolating it completely from its lands, the original village, and Jerusalem. 3 houses in the village currently have pending demolition orders, and the villagers live under constant threat of expulsion. Al Walaja illustrates the paradigm of Israeli policy towards Palestinians throughout the last 64 years, which is one of ethnic cleansing, land theft and apartheid. However, the visit of this group of young Palestinians to the village also illustrates something; it illustrates the Palestinian characteristics of resilience and steadfastness, characteristics that have and will be passed down through the generations. And most importantly it illustrates that despite Ben Gurion's prediction, although the old might die, the young will not forget.